The big news last week was the introduction of Azure DevOps, which represents the evolution of Visual Studio Team Services (VSTS). Azure DevOps is a set of five new services that can be used together as a unified product, independently as stand-alone services or in any combination: Azure Pipelines, Azure Boards, Azure Repos, Azure Test Plans, and Azure Artifacts. 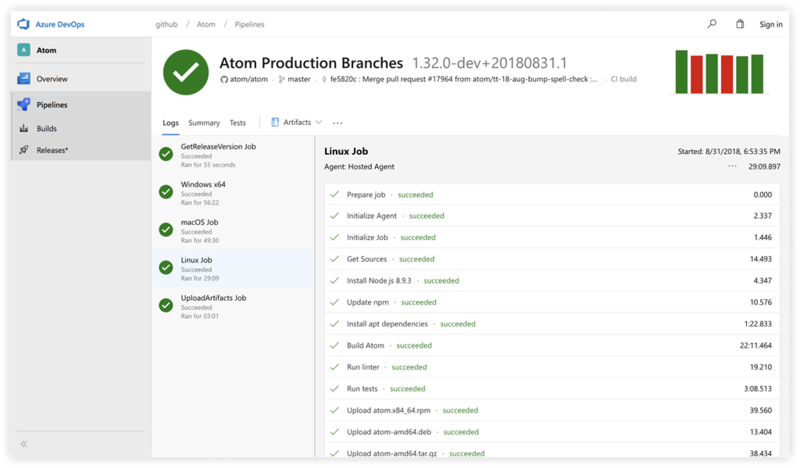 Azure Pipelines is a fully-managed CI/CD service that enables developers to continuously build, test, and deploy any type of app, to any platform or cloud, which is available with free, unlimited CI/CD minutes for open source projects and integrated with the GitHub CI marketplace. In partnership with GitHub, we built an extension for Visual Studio Code that give developers the ability to review GitHub pull request source code from within the editor. Azure DevOps & Azure Pipelines Launch Keynote - Learn all about our announcement from hosts Jamie Cool, Donovan Brown and guests who will cover what's new in Azure DevOps, Azure Pipelines, our GitHub CI integration and much more. Watch more content here: aka.ms/AzureDevOpsLaunch. Introducing Azure DevOps - Announcement blog post from Jamie Cool, Director of Program Management, Azure DevOps that provides a high-level overview of what Azure DevOps is, briefly covers how Open Source projects receive free CI/CD with Azure Pipelines, and outlines the evolution from Visual Studio Team Services. 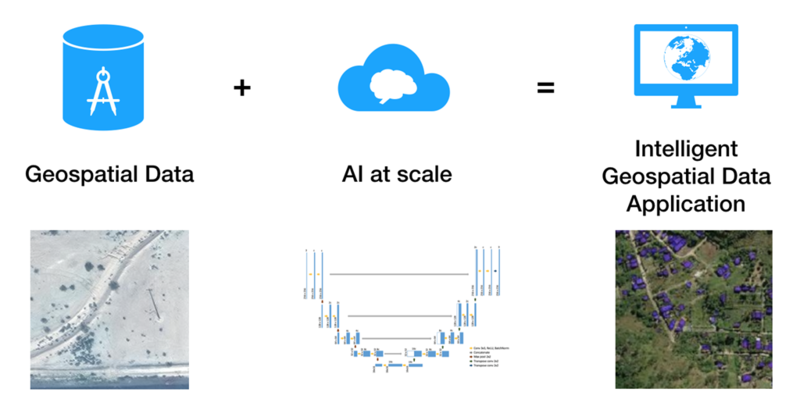 Announcing Azure Pipelines with unlimited CI/CD minutes for open source - Azure Pipelines is a CI/CD service that enables you to continuously build, test, and deploy to any platform or cloud. Azure Pipelines also provides unlimited CI/CD minutes and 10 parallel jobs to every open source project for free. Use the Azure Pipelines app in the GitHub Marketplace to make it easy to get started. Deep dive into Azure Boards - Azure Boards is a service for managing the work for your software projects. Teams need tools that flex and grow. Azure Boards does just that, brining you a rich set of capabilities including native support for Scrum and Kanban, customizable dashboards, and integrated reporting. In this post, Aaron Bjork, Principal Group Program Manager, Azure DevOps goes through a few core features in Azure Boards and give some insight in to how you can make them work for your teams and projects. Video Indexer – General availability and beyond - At the International Broadcasters Conference (IBC) Show 2018, we announced the general availability of Video Indexer, which is a cloud application built on Azure Media Analytics, Azure Search, Cognitive Services (such as the Face API, Microsoft Translator, the Computer Vision API, and Custom Speech Service). It enables you to extract the insights from your videos using Video Indexer's cross-channel (audio, speech, and visual) machine learning models, such as emotion detection and topic inferencing. We also released a new Video Indexer v2 connector for Logic Apps and Flow, which enables you to set up your own custom Video Indexer workflows to further automate the process of extracting deep insights from your videos quickly and easily without writing code. The Azure Podcast | Episode 246 - South Central US outage discussion - Azure services and customers being impacted. Kendall, Evan and Sujit break down the outage and try to understand how Microsoft and its customers can be better prepared from such unplanned events. Application Insights improvements for Java and Node.js - Get an overview of recent improvements in Azure Monitor to enable a first-class monitoring experience for Java and Node.js teams in both their Azure and on-premises environments. Note that all of Application Insights SDKs are open source, including Java and Node.js. HDInsight Tools for VSCode: Integrations with Azure Account and HDInsight Explorer - HDInsight Tools for VSCode extension now integrates with the Azure Account extension, which makes your Azure HDInsight sign-in experience even easier. This release also introduces a graphical tree view for the HDInsight Explorer within Visual Studio Code. HDInsight Explorer enables you to navigate HDInsight Hive and Spark clusters across subscriptions and tenants, browse Azure Data Lake Storage and Blob Storage connected to these HDInsight clusters, and inspect your Hive metadata database and table schema. Announcing the New Auto Healing Experience in App Service Diagnostics - App Service Diagnostics helps you diagnose and solve issues with your web app by following recommended troubleshooting and next steps. You may be able to resolve unexpected behaviors temporarily with some simple mitigation steps, such as restarting the process or starting another executable, or require additional data collection, so that you can better troubleshoot the ongoing issue at a later time. Using the new Auto Healing tile shortcut under Diagnostic Tools in App Service Diagnostics, you can set up custom mitigation actions to run when certain conditions are met. New Price Drops for App Service on Linux - We’re extending the preview price (for Linux on App Service Environment, which is the Linux Isolated App Service Plan SKU) for a limited time through GA. App Service on Linux is a fully managed platform that enables you to build, deploy, and globally scale your apps more quickly. You can bring your code to App Service on Linux and take advantage of the built-in images for popular supported language stacks, such as Node, Java, PHP, etc., or bring your Docker container to easily deploy to Web App for Containers. We'll provide a 30-day notice before this offer ends, which is TBD. Azure Friday | Azure State Configuration experience - Michael Greene joins Scott Hanselman to discuss a new set of experiences for Configuration Management in Azure, and how anyone new to modern management can discover and learn new process more quickly than before. Azure Friday | Unlock petabyte-scale datasets in Azure with aggregations in Power BI - Christian Wade joins Scott Hanselman to show you how to unlock petabyte-scale datasets in Azure with a way that was not previously possible. Learn how to use the aggregations feature in Power BI to enable interactive analysis over big data. Azure preparedness for weather events - Learn how we’re preparing for and actively monitoring Azure infrastructure in regions impacted by Hurricane Florence and Typhoon Manghkhut. As a best practice, all customers should consider their disaster recovery plans and all mission-critical applications should be taking advantage of geo-replication. You can reach our handle @AzureSupport on Twitter, we are online 24/7. Any business impact to customers will be communicated through Azure Service Health in Azure portal. GPUs vs CPUs for deployment of deep learning models - Get a detailed comparison of the deployments of various deep learning models to highlight the striking differences in the throughput performance of GPU versus CPU deployments to provide evidence that, at least in the scenarios tested, GPUs provide better throughput and stability at a lower cost. For standard machine learning models where number of parameters are not as high as deep learning models, CPUs should still be considered as more effective and cost efficient. For deep learning inference tasks which use models with high number of parameters, GPU based deployments benefit from the lack of resource contention and provide significantly higher throughput values compared to a CPU cluster of similar cost. How to extract building footprints from satellite images using deep learning - This post from Siyu Yang, Data Scientist, AI for Earth, highlights a sample project that uses Azure infrastructure for training a deep learning model to gain insight from geospatial data. Such tools will finally enable us to accurately monitor and measure the impact of our solutions to problems such as deforestation and human-wildlife conflict, helping us to invest in the most effective conservation efforts. If you deal with geospatial data, did you know that Azure already offers a Geo Artificial Intelligence Data Science Virtual Machine (Geo-DSVM), equipped with ESRI’s ArcGIS Pro Geographic Information System. Get started with a tutorial on how to use the Geo-DSVM for training deep learning models and integrating them with ArcGIS Pro. How Security Center and Log Analytics can be used for Threat Hunting - Azure Security Center (ASC) uses advanced analytics and global threat intelligence to detect malicious threats, and the new capabilities that our product team is adding everyday empower our customers to respond quickly to these threats. No security tool can detect 100 percent of the attack, and many of the tools that raise alerts are optimized for low false positive rates. In this post, learn how to adopt a threat hunting mindset by proactively and iteratively searching through your varied log data with the goal of detecting threats that evade existing security solutions. Azure Security Center has built-in features that you can use to launch your investigations and hunting campaigns in addition to responding to alerts that it triggers. Five habits of highly effective Azure users - Based on customer interactions, we're compiling a list of routine activities that can help you get the most out of Azure, including staying on top of proven practice recommendations, staying in control of your resources on the go, staying informed during issues and maintenance, and staying up-to-date with the latest announcements. Read this post to learn more about these activities. In addition, staying engaged with your peers to share good habits they’ve discovered and learn new ones from the community is also valuable. How to deploy an Azure Web App using only the CLI tool - Learn how to successfully deploy an Azure Web App by using only the command-line (CLI) tool. Watch to learn how the Azure portal is not only helpful for working with resources, but it also is convenient for using a command-line to deploy web applications. How to work with files in Azure App Service - Learn how to work with files that you’ve uploaded to Azure App Service. Watch to find out what the different options are for interacting with the file system and your deployed applications in the Azure portal. Microsoft Azure Media Services and our partners Welkom you to IBC 2018 - International Broadcasters Conference (IBC) Show 2018 took place last week in Amsterdam. In this post, Sudheer Sirivara, General Manager, Azure Media, covers the announcement that Video Indexer is generally available, how we partnered to showcase "live production in the cloud," how our partners are innovating to deliver a broad ecosystem of media solutions, and that Microsoft has joined the Secure Reliable Transport (SRT) Alliance. From Microsoft Azure to everyone attending IBC Show 2018 – Welkom in Amsterdam! - In this post, Tad Brockway, General Manager, Azure Storage & Azure Stack, shares new ways that Azure, together with solutions from our partners, can address common media workflow challenges. Internet of Things Show | Join IoT in Action to Build Transformational IoT Solutions - Gain actionable insights, deepen partnerships, and unlock the transformative potential of intelligent edge and intelligent cloud solutions at this year's IoT in Action event series. This event series is a chance for you to meet and collaborate with Microsoft's customers and partner ecosystem to build and deploy new IoT solutions that can be used to change the world around us. Internet of Things Show | iotz: a new approach to IoT compile toolchains - iotz is a command line tool that aims at simplifying the whole process. Oguz Bastemur, developer in the Azure IoT team, joins us on the IoT Show to explain and show how iotz can be used to streamline compilation of embedded projects for IoT devices. AI helps troubleshoot an intermittent SQL Database performance issue in one day - Learn how Azure SQL Database intelligent performance feature Intelligent Insights to help a customer troubleshoot a hard to find 6-month intermittent database performance issue in a single day only, how Intelligent Insights helps an ISV operate 60,000 databases by identifying related performance issues across their database fleet, and how Intelligent Insights helped an enterprise seamlessly identify a hard to troubleshoot performance degradation issue on a large-scale 35TB database fleet. Real-time data analytics and Azure Data Lake Storage Gen2 - We are actively partnering with leading ISV’s across the big data spectrum of platform providers, data movement and ETL, governance and data lifecycle management (DLM), analysis, presentation, and beyond to ensure seamless integration between Gen2 and their solutions. Learn how we're partnering with Attunity to help customers learn more about real-time analytics, data lakes and how you can quickly move from evaluation to execution. And join us for our first joint Gen2 engineering-ISV webinar with Attunity tomorrow, Tuesday, September 18th. Azure Marketplace new offers - Volume 19 - The Azure Marketplace is the premier destination for all your software needs – certified and optimized to run on Azure. Find, try, purchase, and provision applications & services from hundreds of leading software providers. You can also find consulting services from hundreds of leading providers. In the first half of August we published 50 new offers, including: Informix, BitDam, and consulting services from Lixar. 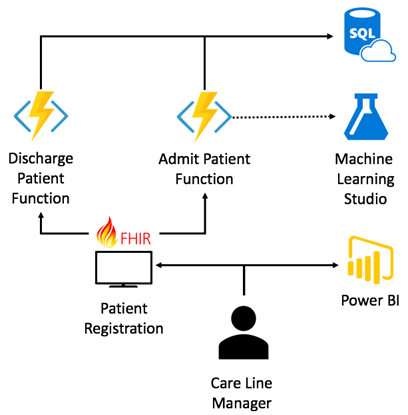 The Azure Security and Compliance Blueprint - HIPAA/HITRUST Health Data and AI offers a turn-key deployment of an Azure PaaS solution to demonstrate how to securely ingest, store, analyze, and interact with health data while being able to meet industry compliance requirements. The blueprint helps accelerate cloud adoption and utilization for customers with data that is regulated. Reduce false positives, become more efficient by automating anti-money laundering detection - Learn how without human intervention, it is difficult, almost impossible to adapt to the rapidly evolving patterns used by money launders or terrorists. We have many partners that address bank challenges with fraud. Among that elite group, Behavioral Biometrics solution from BioCatch and the Onfido Identity Verification Solution help automate fraud detection through frictionless detection. Retail brands: gain a competitive advantage with modern data management - Much of the data collected by retailers goes unused. This occurs because the infrastructure within an organization is unable to make the data accessible or searchable. Learn how great data management provides a significant strategic advantage and enables brand differentiation when serving customers. A Cloud Guru | Azure This Week - 14 September 2018 - This time on Azure This Week, Lars talks about the rebranding of Visual Studio Team Services, the major Azure data center outage in Texas and some great new tools for Spark developers using HDInsights.